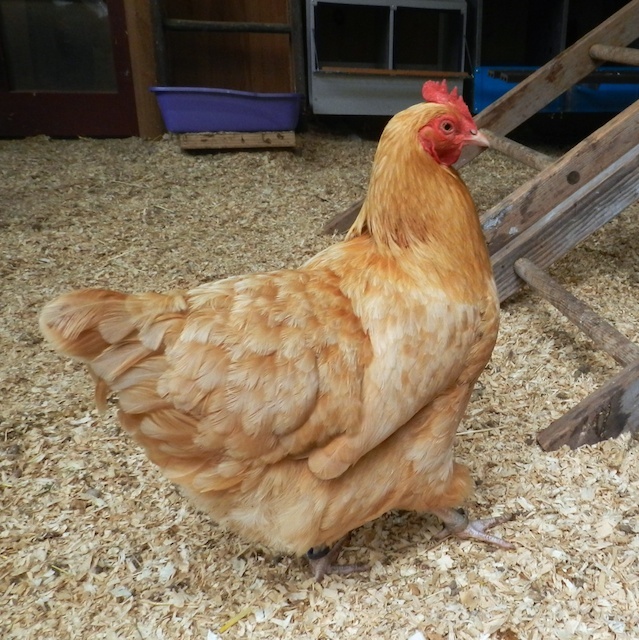 The floor of your chicken coop might be dirt, wood or concrete. On top of that goes bedding.To pick out the right bedding you have to understand what it does, so first I’ll explain its purpose, and then list some of the options. Birds don’t pee – everything comes out in one plop, and that pile is more than 75% liquid. As the manure breaks down it gives off caustic and smelly ammonia fumes, and water evaporating from the manure makes the air damp. Healthy poo is an almost solid pile that is streaked with white. But once a day, a hen leaves a runny brown mess which is expelled from her cecal pouch. This is perfectly normal, although rather nasty. It’s not something easily cleaned off of a bare floor. 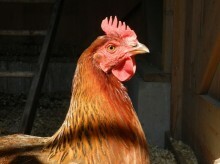 Chickens produce manure all day and all night long. In fact, they poop so much while sleeping that there will be piles of it under the roosts in the morning. A hen is not like a rabbit, which is a tidy animal that likes to have its bathroom area in one place away from her den. Chickens poop everywhere, and they cannot be trained to do otherwise. Each hen will defecate about four ounces a day. So, if you’re going to have chickens, you need to plan for how to keep the coop clean and how to handle that manure. The first step in manure management is to have bedding inside of the coop. I want a coop that I can walk into without saying ewww! The right bedding on the coop’s floor will function to dry up the manure, and keep it as whole as possible, until you, the “farmer” skips it out (use a fine tine pitchfork) into a muck tub and remove it to the compost pile. The right bedding can also keep the hens occupied. They need to scratch, and hard floors cannot satisfy this ingrained behavior. Bare earth doesn’t work either. It stays damp, and the hens will make big craters. Some people tout the use of a deep litter system for their coops, which certainly gives the chickens a thick layer of bedding to scratch in. However, for many reasons, this is not a good choice for most backyard flocks. I write about that here. Pine Shavings: Wood shavings are excellent bedding; bags of pine shavings are widely available at feed stores and are not too expensive. Shavings are absorbent, and it’s easy to use a fine-tined pitchfork to sift through them and clean up manure. Some people have access to the leavings from a friend’s woodworking shop. It’s great to get free material, but make sure that there are no metal bits (chickens will down anything sparkly), that it’s not dusty, and that it’s sized so that the bedding is absorbent (big chunks of wood won’t do!) 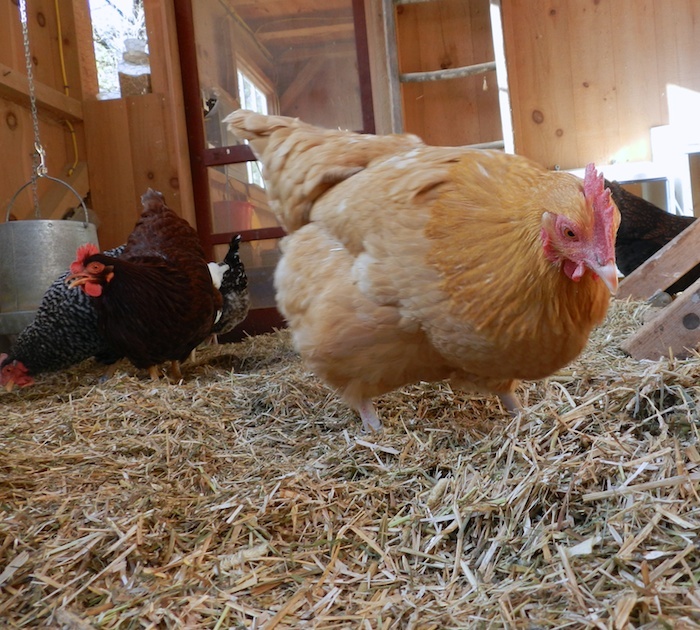 Sawdust is not good bedding because your active chickens will kick up a fine dust and that will cause respiratory issues. Also, be aware that not all types of wood makes for good bedding. Cedar and oak can be caustic, and black walnut is very dangerous for some animals. Pine shavings used as chicken coop bedding. Hay and Straw: These two are not the same. Hay is made of green, tall, grass that has been dried and baled. The tough yellow stalks left over from harvesting grains like wheat makes up straw. Straw, like hay, is sold in large rectangular bales. Both have drawbacks as coop bedding. One serious issue is that chickens can get impacted crops from trying to eat them. 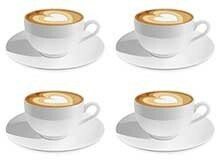 Also, both are poor absorbers of moisture and will mold rather than dry out. Additionally, is difficult to clean manure out of a coop layered with hay or straw without removing all of the bedding, too. Years ago, farmers had chaffing machines, which chopped hay and straw into small bits. Although not as absorbent as wood shavings, chaff is acceptable bedding. There is a new product for backyard flocks that combines chaff with a naturally absorbent mineral. It’s more expensive than pine shavings, but the chickens love scratching in it, and the coop stays very dry. I’ve written about it here. Koop Clean used as chicken coop bedding. Other Plant-based Bedding: There are all sorts of things available on a regional basis – peanut hulls, pine needles, and dried leaves to name a few. Although they are not absorbent, if you have enough, and they are free, and if you remove and replace the bedding weekly, then they are possible options. You’ll know if they’re working okay if the air in your coop smells fresh and feels dry. Sand: I do not like this option. Although it is easy to clean, sand holds moisture. I’ve heard from enough people who have had respiratory diseases and frostbite due to sand flooring to caution against its use. Also if your coop has a sand or dirt floor, rats and predators can easily burrow their way into your coop. I always like to see a solid floor in a coop. Personally, I prefer concrete, but wood floors are also a deterrent to vermin. To tell if you’ve chosen the right bedding, and that you’re keeping it dry and refreshed, stand in the coop (or put your head in if you have a small henhouse.) Breathe the air. If you aren’t comfortable – if your eyes water, if you cough from dust, if it feels damp, then your hens aren’t comfortable either. If, though, it’s so nice in there that you want to pull up a stool and spend time with your chickens, then the bedding is just right.